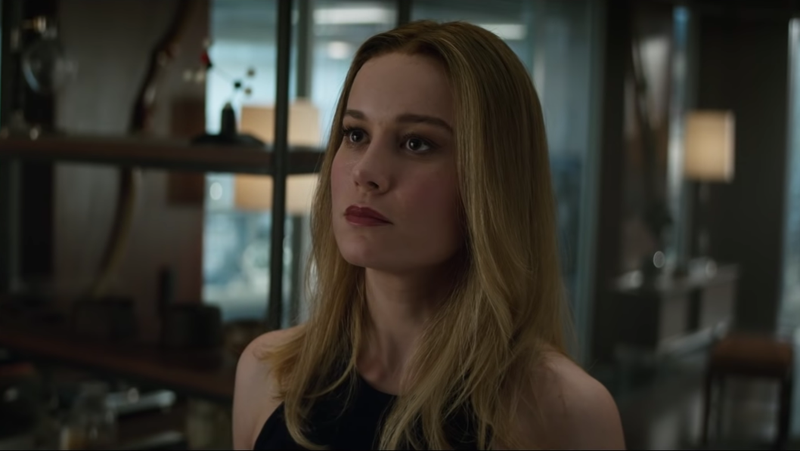 It wasn’t all that surprising to see Brie Larson’s Captain Marvel pop up at the end of the latest trailer for Avengers: Endgame–someone has to beat that big dumb purple guy, after all. It was a little surprising, however, to see Larson sporting a very...different...look. Carol Danvers’ low-key style from the Captain Marvel solo movie had been replaced by straightened hair and a full face of makeup, suggesting that even in space there are YouTube makeup tutorials. Some fans were decidedly unhappy with Captain Marvel’s new look, which was reminiscent of the end of Age Of Ultron, when Elizabeth Olsen’s Scarlet Witch officially joined the Avengers and was given a softer, more conventionally feminine makeover. She [filmed Avengers: Endgame] before she filmed Captain Marvel, and I think she was experimenting with what the character was. And those were the choices that she and her hair and makeup team had made. And I think as she started to gain a deeper understanding of the character, especially as she approached her own movie. She started to make different choices and as an artist she should be afforded that right to make whatever choice that she wants to make. Larson added, “We shot this first so I had to stumble and figure out who this character was with no script for this and no script for Captain Marvel, either, and perform for the first time in front of legends.” It makes sense that, given authorship over her own styling and with no script or real understanding of who Carol Danvers/Captain Marvel is or was, Larson might not have had the best handle on the character just yet. But as we’ve seen in Captain Marvel, Larson totally owns that role. And hopefully she’ll be owning the hell out of Thanos come April 26.